India’s pharmaceutical industry has been growing at record levels in recent years but now has unprecedented opportunities to expand in a number of fields. India’s leading drug manufacturers are becoming global players, utilizing both organic growth, through the gradual development of their business, and mergers and acquisitions (M&A) as they seek to boost their presence in existing markets and open up new ones. In addition, India’s long-established position as a preferred manufacturing location for multinational drug manufacturers is quickly spreading into other areas of outsourcing activities. Soaring costs of R&D and administration are persuading drug manufacturers to move more and more of their discovery research and clinical trials activities to the subcontinent or to establish administrative centers there, capitalizing on India’s high levels of scientific expertise as well as low wages. Healthcare grew from 4 percent of average household income in 1995 to 7 percent in 2005, and is expected to grow to 13 percent by 2025. In terms of scale, the Indian Pharmaceutical market is ranked 14th in the world. By 2015, it will rank among the top 10 in the world, overtaking Brazil, Mexico, Turkey, and South Korea. According to the McKinsey Report, if the underlying growth drivers grow more rapidly then the market may reach to a size of US$24 billion, and if the growth is slower then the market may be limited to US$16 billion. Indian drug manufacturers currently export their products to more than 65 countries worldwide.Their largest customer is the U.S., the world’s biggest pharmaceutical market. The use of generic drugs is growing quickly in the U.S. Low production costs give India an edge over other generics-producing nations, especially China and Israel. Increasing costs of R&D, coupled with low productivity and poor bottom lines, have forced major pharmaceutical companies worldwide to outsource part of their research and manufacturing activities to low-cost countries, thereby saving costs and time in the process. India holds the lion’s share of the world’s contract research business as activity in the pharmaceutical market continues to explode in this region. Over 15 prominent contract research organisations (CROs) are now operating in India attracted by her ability to offer efficient R&D on a low-cost basis. Thirty five per cent of business is in the field of new drug discovery and the rest 65 per cent of business is in the clinical trials arena. India offers a huge cost advantage in the clinical trials domain compared to Western countries. The cost of hiring a chemist in India is one-fifth of the cost of hiring a chemist in the West. In stark contrast to the US, where insurers pay more than 80% of the individual’s healthcare cost, Indian insurers contribute a very small proportion. At present only 3% of the healthcare cost of an Indian patient is paid by insurers; 80% of costs are borne by the individual. However, the insurance sector shows significant improvement with increasing sales of health insurance premiums. This rise in healthcare insurance coverage is attributable to the Insurance Regulatory and Development Authority (IRDA) bill, which has lifted entry restrictions for private players and allowed foreign players to enter the market. Additionally, the increase in consumers’ disposable income further boosts India’s insurance sector. Currently, Tier-1 markets account for nearly 60 percent of the market, and Tier-2 markets account for nearly 40 percent. The significant share of Tier-2 markets can be credited to a large extent to the strong wholesale distribution system. 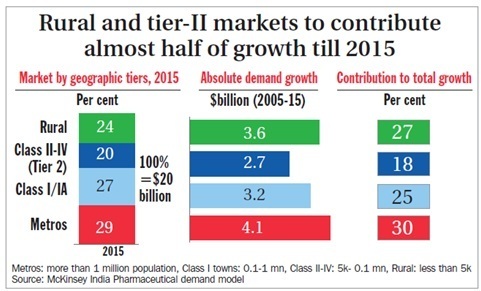 Nearly, 45 percent of the growth will take place in Tier-2 markets. According to the McKinsey Report, by 2015, the share of Tier-2 markets will grow to 44 percent implying a market size of US$8.8 billion.